The aim of this paper is to obtain explicit expressions of the generalizedhypergeometric functionr+2 F r+1 a, b, (a + b + j + 1),(f r + m r ) (f r ) ; for j = 0, ±1, . . . , ±5, where r pairs of numeratorial and denominatorialparameters differ by positive integers mr . The results are derived withthe help of an expansion in terms of a finite sum ofF ( ) functions anda generalization of Gauss’ second summation theorem due to Lavoie etal. [J. Comput. Appl. Math. 72, 293–300 (1996)]. Some special andlimiting cases are also given. Abramowitz, M. and Stegun, I. A. (Eds.) Handbook of Mathematical Functions (Dover, New York, 1965). Karlsson, P. W. Hypergeometric functions with integral parameter differences, J. Math. Phys. 12, 270–271, 1971. Lavoie, J. L., Grondin, F. and Rathie, A. K. Generalizations of Watson’s theorem on the sum of a 3 F 2 , Indian J. Math. 34, 23–32, 1992. Lavoie, J. L., Grondin, F. and Rathie, A. K. Generalizations of Dixon’s theorem on the sum of a 3 F 2 , Math. Comp. 62, 267–276, 1994. Lavoie, J. L., Grondin, F. and Rathie, A. K. Generalizations of Whipple’s theorem on the sum of a 3 F 2 , J. Comput. Appl. Math. 72, 293–300, 1996. Luke, Y. L. Mathematical Functions and Their Approximations (Academic Press, New York, 1975). Miller, A. R. Certain summation and transformation formulas for generalized hypergeometric series, J. Comput. Appl. Math. 231, 964–972, 2009. Miller, A. R. and Paris, R. B. Certain transformations and summations for the generalized hypergeometric series with integral parameter differences, Integral Transforms and Special Functions, 22, 67–77, 2011. Miller, A. R. and Paris, R. B. Euler-type transformations for the generalized hypergeometric function r+2 F r+1 (x), Zeitschrift angew. Math. Phys., 62, 31–45, 2011. Miller, A. R. and Paris, R. B. On a result related to transformations and summations of generalized hypergeometric series, Math. Communications, 17, 205–210, 2012. Miller, A. R. and Paris, R. B. Transformation formulas for the generalized hypergeometric function with integral parameter differences, Rocky Mountain J. Math., 43, 291-327, 2013. Miller, A. R. and Srivastava, H. M. Karlsson–Minton summation theorems for the generalized hypergeometric series of unit argument, Integral Transforms and Special Functions, 21, 603–612, 2010. Minton, B. M. Generalized hypergeometric function of unit argument, J. Math. Phys., 11, 1375–1376, 1970. Prudnikov, A. P., Brychkov, Yu. A. and Marichev, O. I. Integrals and Series: More Special Functions, vol. 3 (Gordon and Breach, New York, 1990). Rathie, A. K. and Pog´ any, T. K. New summation formula for 3 F 2 ( 1 2 ) and a Kummer-type II transformation of 2 F 2 (x), Mathematical Communications, 13, 63–66, 2008. Slater, L. J. Generalized Hypergeometric Functions (Cambridge University Press, Cambridge, 1966). ISNAD Kim, Y. S. , Rathie, A. K. , P, U. , -, - , Paris, R. B. . "Some Summation Formulas for the Hypergeometric Series r+2Fr+1(&frac12;)". 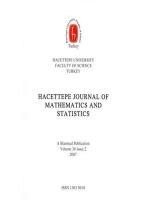 Hacettepe Journal of Mathematics and Statistics 42 / 3 (March 2013): 281-287.